Warm the skillet over medium heat and melt the coconut oil in the pan. Sauté the almonds in the coconut oil for about 1 to 2 minutes, until warm. Strain the almonds and transfer to a medium bowl. 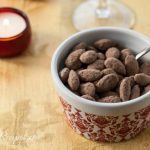 Sift the cocoa powder and sugar together, then sift again over the almonds, tossing and stirring until the nuts are completely coated. Allow to cool and serve. Will keep in a tightly closed jar for a week or two. You can reduce the amount of sugar to your taste. You can find this recipe at https://andreasrecipes.com.